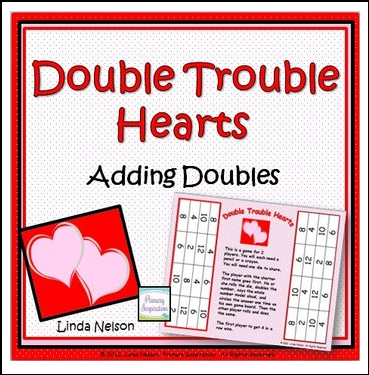 Double Trouble Hearts is a board game for practice with addition doubles facts with sums of 2 to 12. I hope that you and your class will enjoy this free sample activity from my Valentines Day unit, "Valentines Day Literacy and Math:Oh, Lovely Learning! "The complete unit has 17 fun and engaging math and literacy activities! Beside each purchase you'll see a Provide Feedback button. Just click it and you will be taken to a page where you can give a quick rating and leave a short comment about the product. Your feedback is important to me! It helps me to improve products and design the new resources you need for your classroom.